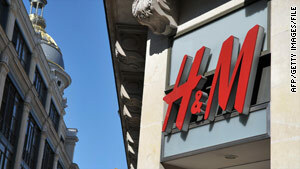 "H" comes from a women's store called Hers and "M" comes from a hunting supplier called Mauritz Widforss. Ever wonder about the stories behind names like CVS or H&M or IKEA? Pharmacy chain CVS started out as "Consumer Value Stores"
(Mental Floss) -- Dozens of companies use acronyms or initials in their names, but how well do you know what the abbreviated letters mean? Let's take a look at the etymologies behind a few abbreviated company names. Sorry, drugstore fans, there aren't three fat cat pharmacists with these initials running around out there. When the pharmacy chain was founded in Lowell, Massachusetts, in 1963, it was known as "Consumer Value Stores." Over time the name became abbreviated to simply CVS. The Swedish furniture giant and noted charity takes its name from founder Ingvar Kamprad's initials conjoined with a the first initial of the farm where Kamprad grew up, Elmtaryd, and the parish he calls home, Agunnaryd. In the late 1960s, Larry Hillblom was a broke student at the University of California, Berkeley's law school, so to pick up a bit of extra cash, he would make courier runs from San Francisco. After he finished law school, he decided the courier business was the real racket for him, so he recruited his pals Adrian Dalsey and Robert Lynn to help him with the runs. Although they started out making their delivery trips in a single Plymouth Duster, the company quickly took off, and they named it after their respective last initials. No surprises here. The telecom giant sprang to life in 1885 as American Telephone and Telegraph, although it's now legally known as just AT&T. The speaker company is named after its founder, James Bullough Lansing. But if Lansing had kept his original name, the company might have been called Martini Speakers. The conglomerate behind Post-It Notes gets its name from its roots as a company that mined stone to make grinding wheels. Since it was located in Two Harbors, Minnesota, the company was known as Minnesota Mining and Manufacturing, which was later shortened to 3M. The stalwart men's underwear maker was originally founded by a group of New Yorkers named Bradley, Voorhees, and Day to make women's bustles. Eventually the trio branched out into knitted union suits for men, and their wares became so popular that "BVDs" has become a generic term for any underwear. The beloved clothing store began in Sweden in 1947. Founder Erling Persson was only selling women's duds, so he called the store Hennes -- Swedish for "hers." Twenty-one years later, he bought up a hunting supplier called Mauritz Widforss. After the acquisition, Persson branched out into men's clothing and began calling the store Hennes and Mauritz, which eventually became shortened to H&M. Roy Allen opened his first root beer stand in Lodi, California, in the summer of 1919, and quickly began expanding to the surrounding areas. Within a year he had partnered with Frank Wright, and the pair christened their flagship product "A&W Root Beer." The adorable gecko's employer is more formally known as the Government Employees Insurance Company. Although GEICO has always been a private, standalone company, its name reflects its original purpose: Leo Goodwin founded the company in 1936 to sell insurance directly to employees of the federal government. The initials you see on darn near every zipper you own stand for Yoshida Kogyo Kabushikigaisha, which translates into "Yoshida Manufacturing Corporation." The company is named after Tadao Yoshida, who started the zipper concern in Tokyo in 1934. If you go looking for Mr. P.F. Chang, you'll be in for a long search. The Asian dining chain's name is actually a composite of the founding restaurateur Paul Fleming's initials and a simplification of founding chef Philip Chiang's last name. The bulk retailer is named after Beverly Jean Weich, whose father, Mervyn, helped found the chain as a spinoff from discount retailer Zayre in 1983. The banking giant's name is an abbreviation of Internationale Nederlanden Groep, or "International Netherlands Group," a nod to the company's dutch origins and headquarters. The company's heavy use of the color orange in its buildings and promotion is also a shoutout to the Netherlands; orange is the color of the Dutch royal family dating all the way back to William of Orange. Brothers Henry and Richard Bloch founding the tax preparation firm in Kansas City in 1955. Their only problem was their last name. The brothers worried that people would mispronounce their surname as "blotch," hardly a term you want associated with your tax return. They decided to sidestep this problem by spelling the company's name "Block" instead, so that nobody would miss the solid hard "k" sound.